Look what our users are saying about us! At FreeStuff.co.uk we work tirelessly to find you great freebies, samples, competitions and hot deals. We love to get feedback from you to hear how we are doing. Webuser Magazine awarded us their Bronze Award in 2010 – Click Here to see what they said about us. 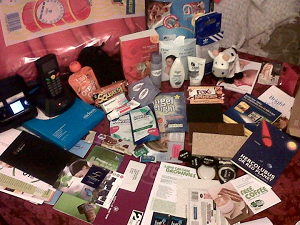 Gareth Drake sent us this picture of some freebies he received. 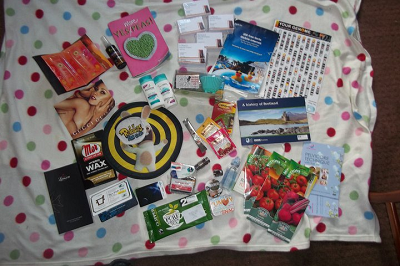 Anna-Louise Hall from Ayreshire sent in this picture of some freebies she received. Thanks for all the comments – to see some amazing pictures of recent wins some of our users have enjoyed click here! We have finally launched the new look FreeStuff. Bigger, bolder and brighter. It also adapts to be easy to use on both tablets as well as smart-phones! FreeStuff is an independent, human curated website, find UK freebies, deals and offers.